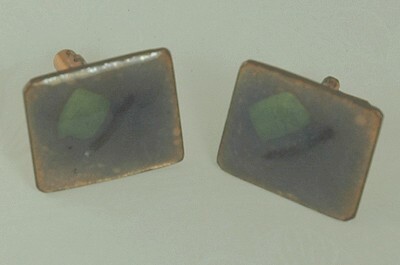 WAS: $41.00 NOW: $30.00 Vitreous enamel is an enamel technique where a powdered glass is applied to metal, in this case copper. A bond between the materials is formed by heating the glass at over 750 degrees centigrade. The powder melts and flows and then hardens into a durable glass or ceramic. These cufflinks were made with this process. The background is blue and the abstract design is done in green and brown. Condition: Excellent vintage. Measurements: 3/4" long and 1" wide.